AMG REVIEW: 1983's Musts features R. Stevie Moore exploring his experimental tendencies in a more accessible framework. The most intriguing part of Musts is the interconnected series of similarly-titled improvisations (all based on segments of one ongoing jam?) on the second disc, which introduce an intriguing series of changes, mostly involving dub-inflected echoing vocals set to the same hypnotic rhythm track. Other highlights include the trippily psychedelic "Song In Motion," which vaguely recalls the early Soft Machine, and the surreal, increasingly disturbing monologue "Happens Every Morning," set to a loop of a discordant synthesizer with its "'50s Monster Movie" button pushed. Side Two is bracketed by laid-back, almost jazzy versions of the older Moore standards: "Cool Daddio" and "I Want You In My Life," sung by Moore in a lazy croon similar to João Gilberto's sleepy murmur. 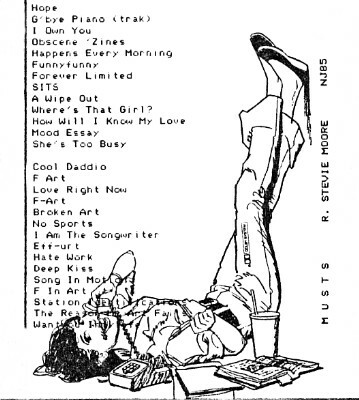 The CD version of Musts, available from www.rsteviemoore.com, also includes 1983's Hostile Territory, an eclectic mix of instrumentals, experiments (the musique concrete "Utensils" is a minute-and-a-half of scrapes and clatters), and dark-toned, largely electronic pop songs, highlighted by an intriguing reworking of "Goodbye Piano" that turns the sprightly novelty into elegant synth pop, and the half-hour title track, a concerto of found tape and slowly mutating drones that is among Moore's finest long-form compositions.